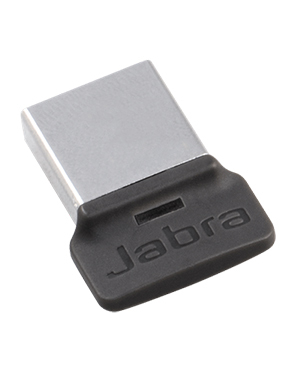 The Jabra LINK370 UC USB Adapter is an enhanced wireless USB adapter that offers Unified Communications and Bluetooth connectivity from a specific model of Jabra headset towards your computer or laptop. Using plug and play connectivity, this adapter makes sure that the high audio quality is extended to more range. Jabra LINK370 UC USB Adapter delivers crystal clear HD voice quality that offers users with life-like conversations through the headset. More than just communication, it also allows the streaming of music. Range(BT): Up to 100 ft./30 m.
Get to know more about this product giving our company a call today through our hotline: Australia wide 1300 131 133! Jabra is a popular developer of corded and wireless headsets. It is a leading enterprise in the development of technologies and solutions capable providing customers the best audio and sound experience. Some of these headsets can be connected to mobile devices while some are only compatible to PCs. These products are used in office-based locations and contact centres. Jabra has become a top-notch audio brand since its inception because the brand has become the epitome of flexibility, innovative design, and comfort. Its performance in the market is considered one of the best, especially in terms of product development.